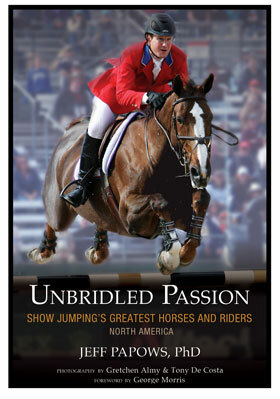 By Lauren Fisher For Jennifer Wood Media Inc.
McLain and Sapphire, Beezie and Authentic, Ian and Big Ben… These are just a few of the great partnerships in show jumping history that are detailed in Jeff Papows’ new book,Unbridled Passion – Show Jumping’s Greatest Horses and Riders. Released by Acanthus Publishing, Unbridled Passion made its formal debut during the Fidelity Investments Jumper Classic, September 14th – 18th. The book documents the incredible relationships between some of North America’s most renowned horses and riders, telling the life-changing stories of their sacrifices for the love of the sport. Through the wonderful highs and heartbreaking lows both in and out of the ring, Papows gives readers an inside look at what it takes to be on top in the competitive world of show jumping. Telling many stories never heard until now,Unbridled Passion gives complete insider views and behind the scenes accounts of some of the sport’s most poignant moments. The book features the awe-inspiring stories of 22 horse and rider combinations, with a foreword by legendary U.S. Show Jumping Chef d’Equipe George Morris, and beautiful photography by Gretchen Almy, Tony DeCosta, and Bob Langrish. Papows had his work cut out for him at the beginning, facing the challenge of getting in touch with not only the riders but also the owners, trainers, grooms and many other people that make up the support system of a top equestrian partnership. The sport of show jumping involves a lot of traveling and horses and riders are never in one place for long. The hard work quickly paid off as he saw the overwhelming enthusiasm that the participants showed for his project. 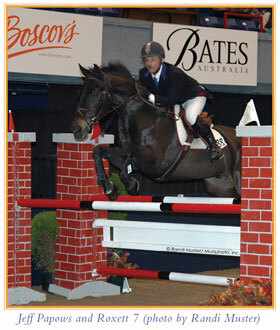 The ups and downs of competitive show jumping made the sport the perfect subject for Papows’ book. The biggest surprise to the author as the book progressed became the pure reality of the stories. The riders themselves are grateful to Papows for sharing the stories of their most treasured horses with the world. Many riders expressed their appreciation personally.